Badminton Asia paid a glowing tribute to Dr. Tong Yun Kai for his contribution to the sport in the continent. Its president Mr. Anton Aditya Subowo saluted Yun Kai for his dedication to the shuttle sport and fittingly the Badminton Asia Mixed Team Championships is now named after him. Now known as Badminton Asia Tong Yun Kai Cup Mixed Team Championships, the inaugural meet was held in Ho Chi Minh City, Vietnam in 2017 with Japan emerging as champions. "It is an honor he (Dr. Tong Yun Kai) fully deserves for his contributions to the sport in Asia," said Mr. Anton. Fittingly, this year's mixed team championships returned to the home of Dr. Tong, which is Hong Kong China." The championships were played at the Queen Elizabeth Stadium in Wanchai from March 19-25 and attracted 11 teams. China was crowned as the new champions after defeating defending champions Japan 3-2 in a nail-biting thriller on Sunday (March 24). "The Tong Yun Kai Cup is to honor Dr. Tong for his great contributions to badminton during his serving time as the president of, both, the Hong Badminton Association and also Asia Badminton Confederation (ABC) which is now known as Badminton Asia. 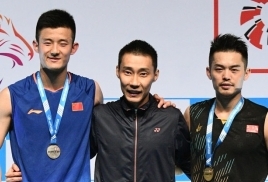 On behalf of Badminton Asia, we would like to give our greatest appreciation to the chairman of Hong Kong Badminton Association Mr. Tong Wai Lun, the Hong Kong Badminton Association, government officials, the sponsors and the organizers for their tireless efforts and support which ensured the success of the championships." Without a doubt, bringing international championships such as the Badminton Asia Tong Yun Kai Cup Mixed Team Championships to Hong Kong China also gave local and international fans to "enjoy the sport" apart from enabling host cities to "promote" their local delicacies and culture. "More importantly it is also a great opportunity to promote the sport to the locals as Badminton Asia continues its efforts to take the game to all corners in the Asian continent," added Mr. Anton. 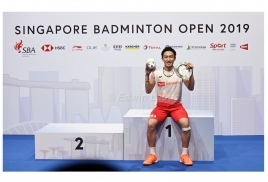 "At the same time, these championships will bring stronger bonds amongst Asian families. We are looking forward to working hand-in-hand with you in the further future. Eleven countries are competing in this year's championships, including defending champions Japan. The other countries are China, Indonesia, Hong Kong China, Chinese Taipei, India, Singapore, Thailand, Sri Lanka, Malaysia, and Macau China.